I love happy accidents… especially in the kitchen! This was one of them. One Sunday afternoon when the craving for noodles hit but the pantry was almost bare and I was too lazy to go out to the store, this happy accident happened from leftovers in the fridge, believe it or not. Since then, Jade has requested this dish numerous times. We’ve done some variations on the recipe, especially the meat used, and it always comes out delicious. It’s also great with veggies! At the time I first made this dish, I didn’t have any veggies in the refrigerator except for the purple basil from the garden and a couple of peppers. Those were the inspiration for this dish. 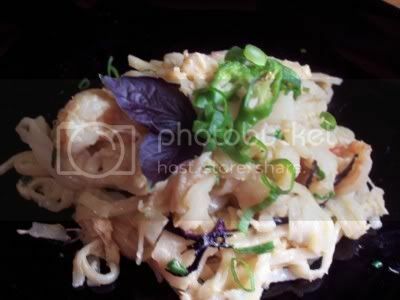 Cook the rice noodles in boiling water for about 3 minutes or just until they are al dente. Try not to over cook them as they can start falling apart on you when you stirfry. Drain, and set aside. Heat some oil in a wok and add the garlic and shallots until they are fragrant and are starting to brown on the edges. Add the chicken, coconut milk and sauces and let it come to a simmer. Add the noodles, toss together. Season to taste, and add the chili pepper, basil and green onions just before serving. This looks super-tasty – I will have to try it! Hi sue, thanks! I know what you mean about not having a decent internet connection…. it’s not fun at all. I’ve been bad about bloghopping lately that’s probably why I haven’t been too inspired to cook anything new. I’ll be visiting your blog soon. I love your blog here jmom. I just got high speed internet so maybe I can visit more often. My old got so bad I couldn’t even log into my own blog.